Charles Dickens needs no formal introduction, having been the most popular English writer of the 19th century and still one of the most popular writers in history today. Dickens upbringing was a mixture of happy times and sad: when he recalled his father being sent to debtors prison in his memoirs, his tears actually left marks on the page. Nevertheless, Dickens was obsessed with reading, making him a natural journalist by the age of 20, when he began a career in journalism. Along the way, he also began writing his own short stories and materials, often serializing them in monthly installments in publications, a popular method of publishing in the 19th century. Unlike most writers, Dickens would not write an entire story before it began its serialization, allowing him to work on the fly and leave plot lines up in the air with each opportunity. By the time he died at the relatively young age of 58 from a stroke, he was already Europes most famous writer. His obituary noted that Dickens was a sympathiser with the poor, the suffering, and the oppressed. Dickens was interred in Westminster Abbey, a rare honor bestowed only among the greatest and most accomplished Britons. Many of Dickens novels were written with the concept of social reform in mind, and Dickens work was often praised for its realism, comic genius and unique personalities. At the same time, however, Dickens ability as a writer was nearly unrivaled, with his ability to write in prose unquestioned and unmatched. His two most famous novels are Great Expectations and A Tale of Two Cities, widely considered two of the Wests best classics. A Tale of Two Cities is often considered the greatest historical fictions of all time. Set in London and Paris before and during the French Revolution, the novel depicts the plight of the French peasantry at the hands of the aristocracy in the years leading up to the revolution, followed by the brutality of the Reign of Terror. Dickens juxtaposes French society with Londons society during the same period while tracking characters in both cities, including Charles Darnay and Sydney Carton. The classic touches on social justice, romance, morality, good and evil. Great Expectations is widely considered one of the Wests best classics and still acted out hundreds of times across the world each year. First published in serial form in 1860-1, the novel is written in the first person from the point of view of Pip, an orphan. Pip encounters several different kinds of people of all classes, and he gets himself in and out of hairy situations, touching on themes such as ambition, crime, and social class. Of course, Pips encounters are inspired by Charles Dickens own experiences and observations of the people and the world around him in 19th century London. 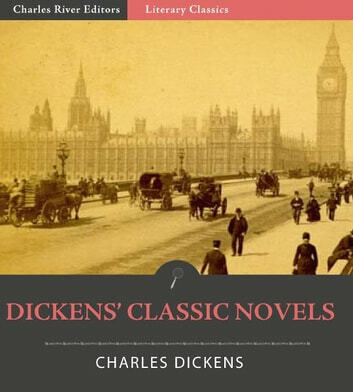 This edition of Dickens two classic novels is specially formatted with a Table of Contents and includes pictures in both books.